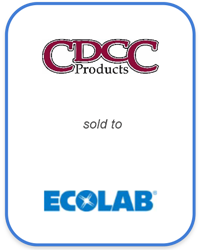 Founded in 1996 by 2 seasoned coffee industry veterans, CDCC was a highly profitable manufacturer of a proprietary line of powdered and liquid chemical cleaning products. Its portfolio of patented products are used in equipment that prepares and dispenses coffee, tea and other specialty drinks. CDCC’s family of cleaning products serves distinct market segments, including: specialty coffee houses, coffee roasters, convenience stores, foodservice, quick serve restaurants, and vending/ocs. The owners were facing a dilemma: whether to raise a round of growth capital or monetize their investment given unsolicited inquiries by interested strategic buyers. The banking team conducted a deep-dive analysis of the business and industry segment; subsequently delivering a thorough presentation of prioritized strategic alternatives. The owners decided to sell the company given persistent unsolicited indications of interest from 2 large strategic buyers. A rigorous competitive auction process was undertaken, resulting in offers from multiple strategic and financial buyers. The business was sold on favorable terms; including a significant cash price premium above initial buy-side offers.